Orange County is pleased to present the 2012 Golden Foodie Awards. The inaugural red carpet culinary awards show will celebrate the best in local food, restaurants and chefs. The Golden Foodie Awards season will launch in June with a calendar of special foodie events at restaurants and venues throughout the county leading up to the main Awards night gala on Sunday, September 30, 2012 at The Fairmont Newport Beach. House of Balsamic is an importer and distributor of fine Italian food products in Orange County. They are always in pursuit of unique gourmet food to create amazing culinary experiences. They offer high-quality ingredients and a knowledgeable staff, who are available to answer any questions along the way. House of Balsamic takes quality to the highest level. They travel abroad to find the rarest and highest-quality artisan products from around the world, making these products readily accessible and available to their customers in the United States. On June 19, 2012, Seasons 52 rolled out their new summer menu across the country savoring the fresh flavors of summer. Just like the name, Seasons 52 is always inspired by seasonal, farm-fresh produce and meats. I have personally been to the Fort Lauderdale and Orlando locations many times. I am so happy that we now have a location in Orange County where everyone can experience their wonderful cuisine. The restaurant interior is cozy with a slightly dark ambiance, which makes you focus on your food instead everyone else. Even on a Tuesday night, the dining room was bustling. I always get a little giddy when I go to a Seasons 52 as the surprise of what is on the menu just makes me so excited – the life of a foodie! Lucy always wanted her own restaurant. A perfect location opened up in Downtown Fullerton where the Lollicup used to be. With the interior already set-up as a tea-boba house, Eden Café opened in August 2010, serving food as well as all of the tea & fruit drinks that people crave. The interior is very neo-Tokyo with comfy sofas, chairs, and games. With Fullerton College within walking distance and Cal State Fullerton within a few minutes’ drive, it’s the perfect hang out for college student before, between, and after classes. It’s great place just to unwind and relax or sip a drink and munch while studying for your next class. It’s also a great place to meet for a study group. Lucy’s aspirations have raised the culinary bar. She makes her own soy milk for Eden Café’s beverages and prepares the fresh spring rolls daily. Tim Parsons and his family love to cook. Food brings the ohana together in the Hawaiian Islands. It all started from the family’s home school garden. With fertile volcanic soil, the jalapenos ripen in abundance. They didn’t want the produce to go bad, so Tim put on his thinking cap and decided to make a sauce with them. Eventually, it became a staple condiment on their table in an old shoyu (soy sauce) bottle. As family and friends came over, they wanted their own bottle to take home with them to use at their house. In 2011, Tim brought his family recipe to the public as Adoboloco Jalapeno Sauce. I can see why. This sauce is very tasty. First 50 readers will receive 15% off your purchase. Read my article to get the coupon code! Tum Cohl and Evan Goldberg are Canadian natives who moved to Los Angeles to start their careers in the movie and music industries. After moving from Canada, they missed a special part of their college days in Montreal – poutine. Poutine is a Canadian comfort food consisting of fries, gravy, and cheese curds. A light bulb went off! With many Canadian transplants in California, they decided to start a stand on movie sets to cater to the hungry production crews. They became so popular, that in March 2012, they made a move to the gourmet food truck world. Susan Feniger and Mary Sue Milliken have gone mobile with their take of bold flavors of Mexico. It is not an impossible task, as many gourmet food trucks have proven, to have fresh, restaurant quality food out of a mobile food truck. Foodies flock from miles around just to see the crazy truck designs and delight their taste buds. Chefs Susan and Mary Sue had the perfect concept to go mobile with their modern Mexican cuisine. Let’s take a look at some of their ingenious menu choices. 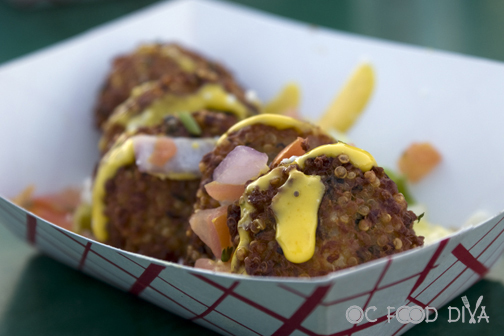 Quinoa Fritters are made with quinoa (crunchy Aztec grain), cojita cheese, and topped with aji amarillo aioli. These babies had a crunchy exterior (from the deep fryer) with a nutty flavor from the quinoa. The cilantro and cojita cheese on the inside pumped up the flavor a bunch of notches. It was the perfect snack food – like a healthy tater tot! Thumbs up, way up!